A Day Hemmed in Prayer is Less Likely to…. Unravel. Ever have one of those days? Where they seem to unravel before your very eyes? I have had several. Lately. All at once. To the Master Tailor. He stands at the ready with needle in hand. Ready to put things back in order for me. All I have to do is “stand still”…..and see the salvation of the Lord. Hemmed in by the Master. Best place to be in my opinion. What you see here on this page was a wonderful discovery. Two Wednesday nights ago, I came home deeply burdened for a family problem. Wasn’t mine. But it hurt as if it were. As I was preparing for a small Bible Study session of just two, I began to talk to the Lord. He heard. He listened. He answered in the most unique way. I told Him this: “Lord, Wanda would love to be here to pray with us over this. This is exactly what she loved to do. Pray for the needs of others.” And I began to cry just a bit. As I do fairly often. As I loaded the dishwasher, the prayer and thoughts were still on my mind. And all of a sudden I had an urgency to go to the little study room where I had unloaded the things from Wanda’s “sewing room” the week before. I had not looked at “everything” yet. As a matter of fact, the thread boxes were the last thing to look into. 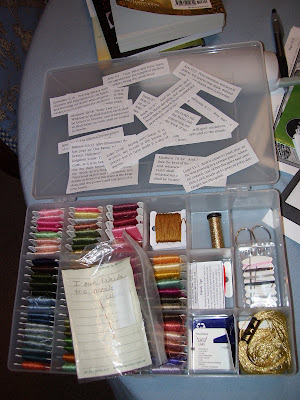 I had plundered the cross stitch pages and packets. I had touched all the hoops, felt of all the fabrics, but had left the thread box. Why? Well, it was a clear box…and clearly full of thread. Why open it? Why indeed. When the urgency to “do something” comes over me, I generally obey. So I left my dishes as they were, dishwasher still open and walked to the room and grabbed the box. I just looked at it. Pretty colors all neatly lined up like jewelry ready to wear. Then I noticed in one corner of the box what looked like several folded pieces of paper. I opened the box for closer examination. When I unfolded them and began to read, I began to weep. I said, “Lord, this is exactly what Wanda would say.” Every single verse was about prayer. She was using them to “hide in her heart” as she stitched. She was hemming her day in. She was closing the gap in all of our lives. The seam was strong. The Threads unbreakable, because she used the Thread of the Holy Spirit in her life. When my visitor arrived, I fixed a cup of tea for each of us and we settled in to pray, share and read some Word. After she spilled her heart, I began to unfold the neatly clipped papers and spread them out on the table. As I read each one, she began to see the “thread of hope”. The thread of consistency. 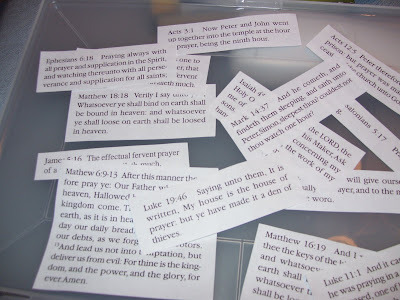 The lifeline of salvation available to each of us….through prayer. Girls, this is not my usual thankful post. But I just have to share what I am most thankful for. Although I love each one of you, I am thankful most of all for Jesus. For Salvation. For the grace and mercy extended to this wretched sinner. For the prayers of many when I was far from God. For the ability to pray even now for unsaved prodigal children. For your prodigals as well as mine. I am thankful that when I hem my day —-with prayer—it does not unravel. It holds strong. After all, I have just sat before the Master Tailor. This entry was posted on Thursday, May 1st, 2008 at 6:11 am	and posted in An Angie Story, Borrowed Blessings, Country Life Messages, faith, Thankful Thursdays, Wanda. You can follow any responses to this entry through the RSS 2.0 feed. Oh Angie,This is so Wanda…. I am humbled and loving her.Thank you for sharing this with me. Know I am praying for you and your dear family, whom I love.Have a great day tomorrow Ang. You sparkle with the precious love of Jesus, keeping you wrapped in my prayers. I love you. Thank God for prayer. Happy TT. Thanks for sharing this beautiful story. Isn’t God something?! What a wonderful discovery! Hemming ourselves in with prayer… a beautiful metaphor. What a blessed way to start the morning and reading your TT post; *Hugs* I love you Angie and God loves you SO much for your faithful and dear heart.Amen that above all else, there is Jesus Christ. He is our Rock, our Redeemer, Our Comforter, Our Friend. He is there when we least expect it and it’s always awe inspiring how perfect God’s timing is; He is the perfect Tailor who knows how to put just that right stitch to turn that project from something regular to something wow!God bless you so much for sharing this wonderful reminder to us all. Amen, what a beautiful post. We will NEVER unravel with the Master! Angie,Your beloved Wanda has given you another gift. What a beautiful soul she is!Hemming my day with prayer is the way to live. Thank you for this post. I’m so blessed to read your message. Oh Angie… how wonderful is our God that He blessed you with this today!!! He is just AWESOME!!! Please know that you are prayed for and dearly loved!! Ah, gee, Angie, you made me cry…but I loved this post. It’s so like you….and so much like our Lord. What a beautiful Thankful post. Thank you so much for sharing from your heart. I love the prayer as “thread of hope”. How true! Daily I pray for my prodigals…and those prayers are my “thread of hope”. God Bless! Angie,I had the most amazing sermon today at church and as the Pastor was talking about the importance of God’s word and hiding His word in our hearts, I thought about this post…God bless you for sharing this with us! This is very touching…Just thinking of Wonda at HIS right hand smiling. I hope your refreshed from your journey.